My family and I experienced an 8-week driving trip around the USA a few years back, and we drove endlessly across Texas until we were satisfied that we had found a proper place to eat BBQ ribs. Have you ever driven across Texas?? Yeah, it’s quite big. But those ribs were worth the drive. My son Brooks (now age 13) goes absolutely nuts for ribs these days. He begged me last weekend to make some for dinner, and I happily complied. 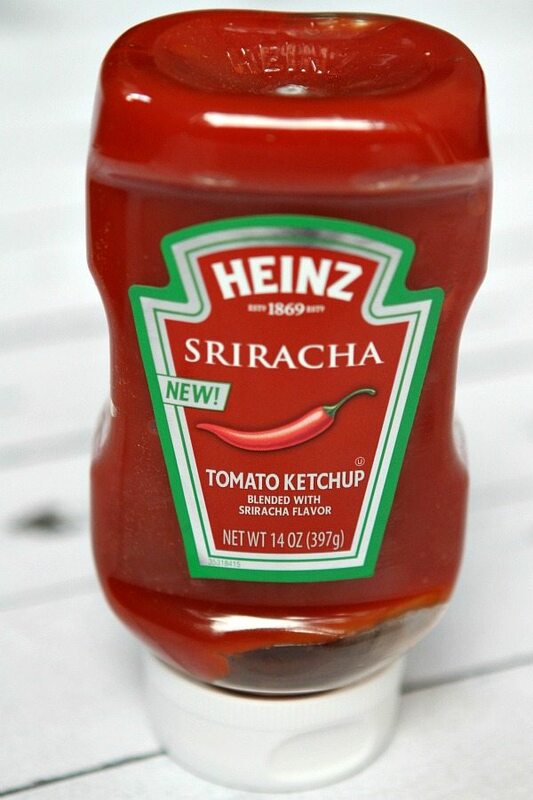 Heinz has a new product that has just debuted: Heinz Sriracha Ketchup. Sriracha happens to be a hot flavor trend right now. Heinz listened to consumers and created Heinz Tomato Ketchup blended with Sriracha flavor, which is infused with spicy chili pepper and garlic flavors. 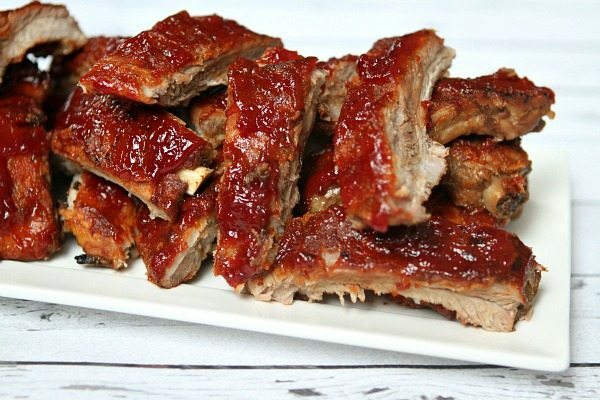 I worked with Heinz to create a new recipe, and I chose to use their new ketchup in my slow cooker baby back ribs. 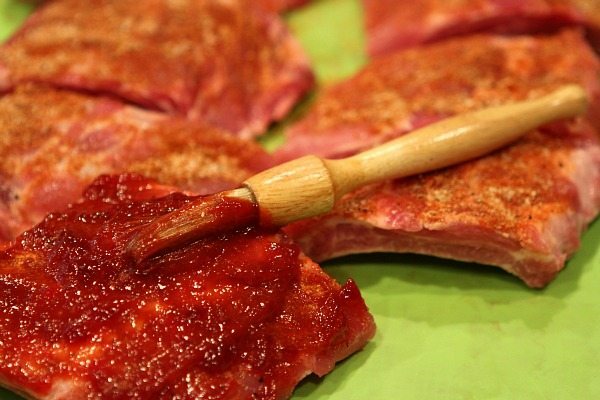 I rubbed my baby backs with a simple smoked paprika/garlic powder rub, then brushed them with a blend of the Heinz Sriracha Ketchup and cranberry sauce. I love that these are so easy to make in the slow cooker. 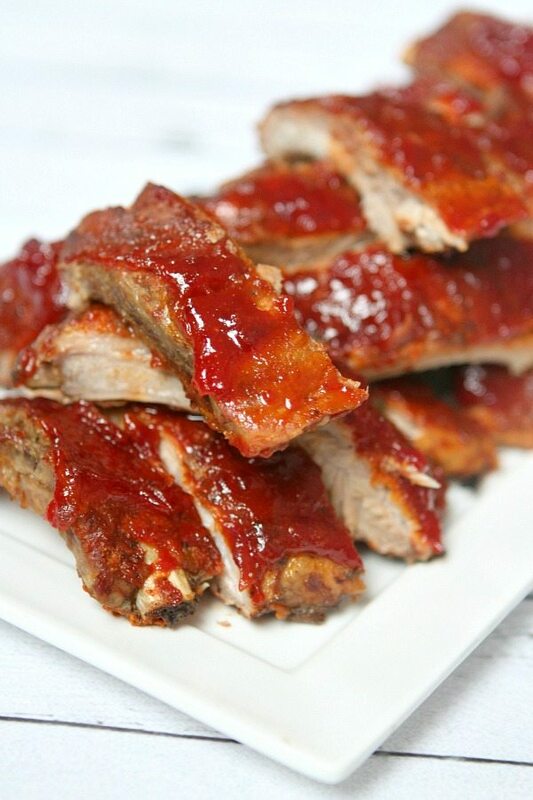 The ribs are cooked on high for just 3 1/2 hours in a small puddle of water. Once they are done slow cooking, they’ll be just tender enough to pull off the bone easily enough (but they won’t fall off the bone, which can be pesky). 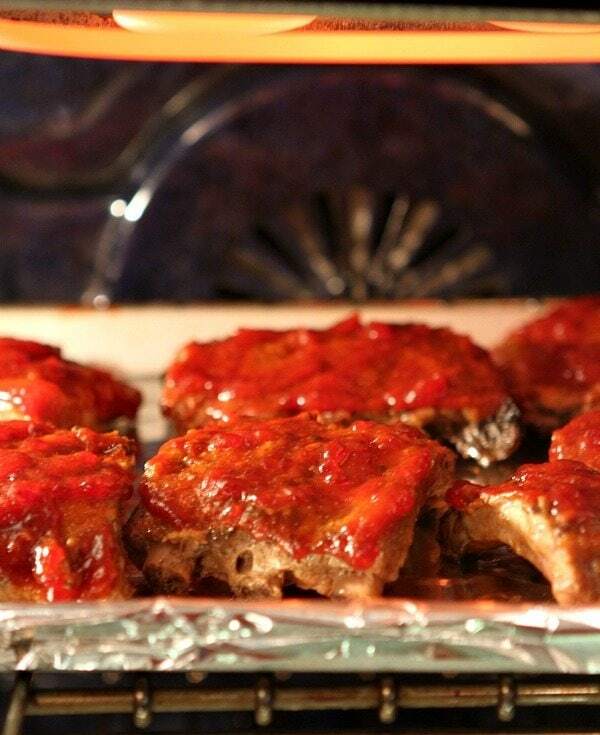 The ribs are brushed with additional Sriracha- Cranberry sauce and placed until the broiler until bubbly and hot. At this point, they are ready to eat immediately. And you should do so! I can’t compare these to our Texas ribs because those were made with some pretty classic BBQ sauce that is unique to Texas! But my family did love this different kind of take on ribs. The Heinz Sriracha Ketchup has just enough spice to make it interesting (but not so much that it scares the kids away), and the addition of cranberry sauce makes them a little bit sweet too. Next time I’m trying the Heinz Sriracha Ketchup to jazz up my burgers and fries! 1. In a small bowl, mix together the paprika, garlic powder, salt and pepper and set aside. 2. In a medium bowl, whisk together the Heinz® Tomato Ketchup Blended with Sriracha Flavor and cranberry sauce until smooth. Remove 1 cup of the sauce and set it aside. 3. 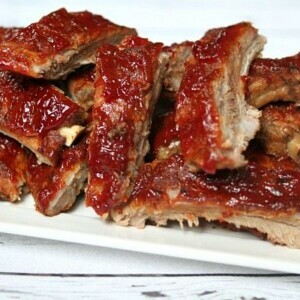 Remove the ribs from the package and pat dry, and set them meaty-side-up on a cutting board. Cut the ribs into 3 to 4 rib sections. Sprinkle the dry spice mixture onto the meaty side of the ribs and press to adhere to the meat. 4. Pour the water into the bottom of the slow cooker. 5. Spread the sauce generously onto both sides of the ribs. 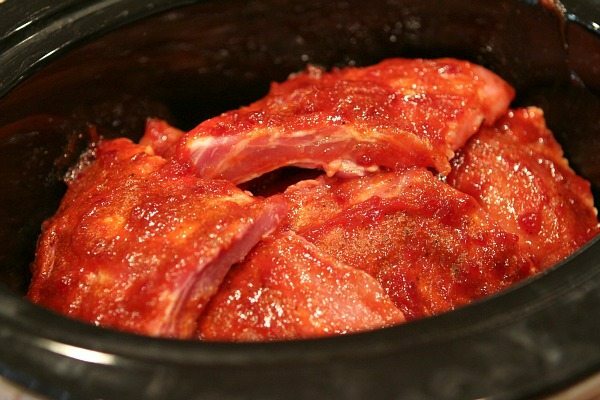 Set the ribs into the slow cooker. Cook on high heat for 3 1/2 hours. 6. Remove the ribs to a baking sheet (meaty-side-up). Preheat your oven broiler. 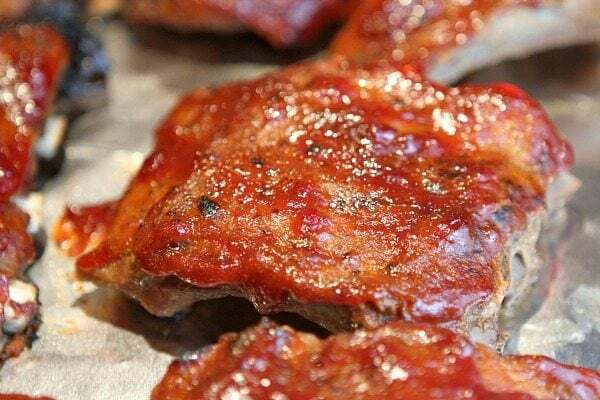 Brush the remaining 1 cup of sauce onto the meaty side of the ribs. Broil for 3 to 5 minutes, or until the sauce is bubbling. Serve immediately. Disclosure: This post has been written in partnership with Heinz. I only write about products that I use and love in my own kitchen. All opinions shared are my own.